The temperature across the river basin varies according to elevation and, to a much lesser extent, latitude. Mean monthly temperatures for the coldest month, July, vary from below 13°C for higher elevation areas in the south of the basin to 23°C for low elevation areas in the delta in Mozambique. 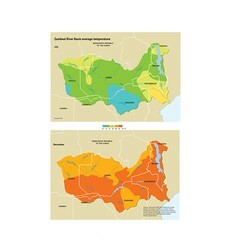 The coolest area is the south-eastern part of the basin, part of which is in Zambia and the other part is in Zimbabwe. Ground frost occurs locally in some parts of the basin between July and August as daily minimum temperatures in higher elevation areas can be below 0°C. 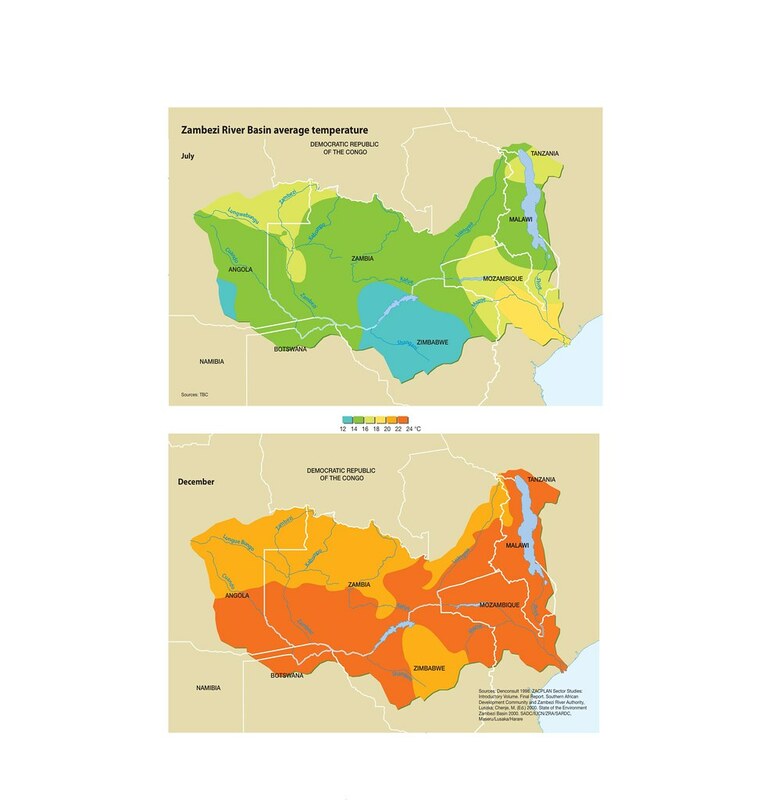 Mean daily temperatures for the warmest months (October and November) vary from around 23°C in the highest elevation areas, to 31°C for the lower parts of the Zambezi Valley (Chenje 2000). The basin experiences a high daily range of temperatures, with an average range of about 10°C in the rainy season and as much as 20°C in the dry season in the southern parts of Zambia and northern Zimbabwe. Due to the high temperatures, the annual total evaporation ranges between 5 to 10 mm per day. As a result, about 65 per cent of all the rainfall evaporates as soon as it falls, 20 per cent is lost through evapotranspiration and an average of 14 per cent is available as surface runoff (Chenje 2000).